En route to her new home, Chihiro reluctantly follows her parents through a decrepit tunnel and to an abandoned amusement park. 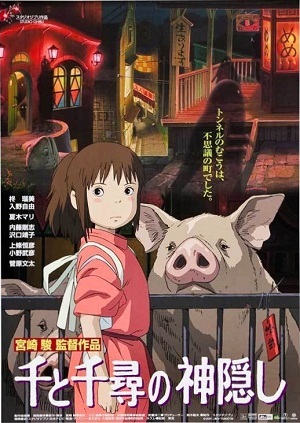 When her parents begin eating a mysterious buffet of food left out at a restaurant, they are magically transformed into pigs – and Chihiro finds herself contracted to work inside a magical bathhouse that serves the spirits and supernatural creatures of the area. I do not think it is an exaggeration to claim Japanese animator Hayao Miyazaki to be pretty much the greatest director of animated features of all time. His films are not simply beautifully designed and animated; they have immensely powerful stories and richly developed characters. They are plotted with forethought and a remarkable delicacy. Choosing one of his eleven directorial works as an ‘all-time best’ will always be a contentious choice; many tend to choose his charming 1988 children’s film My Neighbor Totoro, which is certainly his most iconic work (and the one that generates the greatest amount of merchandising revenue for his company Studio Ghibli). Personally I find Spirited Away has a complexity and a maturity that exceeds the earlier work. It is a phenomenally, essentially faultless work of film art. With Spirited Away Miyazaki presents an intricately developed fantasy world with a visible society, hierarchy and tradition. That culture is never fully explained to the viewer because it does not need to be; like Chihiro, we are simply temporary visitors to a strange and unfamiliar world. It seems a little familiar around the edges, with elements cribbed from Japanese mythology (but not as much as you might think) and Lewis Carroll, and a design aesthetic largely taken from the Taiwanese town of Juifen, but the genius of Miyazaki’s film is that it is all remixed and reworked into its own hugely evocative identity. There are very few films made – either in animation or live-action – that are as successful as world-building. There is also such an admirable attention to detail. Characters have little quirks and tics. Time is taken to flesh them out and make them see more real and understandable. In one early scene Chihiro is secretly taken to see her parents, now transformed into pigs. Immediately afterwards she takes a pause in the bushes and simply bursts into tears. The stress of her fantasy adventure is simply all too much. By taking 20 seconds out of his film to showcase that brittle reality early on, Miyazaki allows Chihiro’s courageous actions down the line to take on even more power and strength. A faultless hero winning the day feels commonplace. A flawed and terrified girl doing the same feels extraordinary. Joe Hisaishi’s orchestral score is one of his all-time best, which given he is Japan’s foremost film composer is honestly saying something. The voice acting is superb, both in the original Japanese dub and in the popular English-language alternate by Walt Disney Pictures. The elements that make Spirited Away work are evident in all of Miyazaki’s films, but here they all seem to be working at their very best. Every time I watch it I know going in that it is one of the best films I have ever seen, and each and every time it still manages to surprise me with just how good a film it is. It is without doubt in my mind one of the finest feature films ever made.